In December, Feldman Shepherd held a “Strategies for Developing the Blockbuster Case” CLE in Pennsylvania. 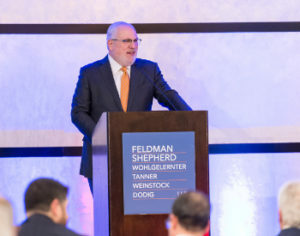 Moderated by Ezra Wohlgelernter, the program was held on Wednesday, December 12, 2018, at The Sofitel Hotel, in Philadelphia. Alan M. Feldman and Edward S. Goldis began the seminar by presenting on their use of mock juries to strengthen their cases by developing effective case themes, testing theories of liability, preparing for anticipated defenses, heading off unanticipated issues before they happen, determining their ideal juror, and assessing potential damages. John M. Dodig and Jason A. Daria then spoke on maximizing jury damage awards. Their presentation included strategies and real-life examples for humanizing clients and demonstrating how their injuries catastrophically impact their entire family, techniques for presenting testimony that emphasizes loss of life’s pleasures and pain and suffering damages that can be used for impactful closing arguments, and tips for persuasively arguing damages during closing arguments. Carol Nelson Shepherd addressed proving medical malpractice cases in 2018, with a focus on how fetal heart monitoring strips provide unbiased, irrefutable medical evidence upon which plaintiffs’ counsel can effectively build their legal arguments. Mark Tanner presented on cross-examining the defense medical expert, with an emphasis on tactics and techniques, tools for investigation and thorough preparation to damage the credibility of the defense expert, and strategic considerations during cross-examination. Scott Vezina gave an interactive presentation on life care plans and proving life expectancy in which he presented direct and cross-examinations from a real case to show how life expectancy can be proved without stripping clients of all human qualities, reducing them to a set of statistical data on an actuarial table. Roberta D. Pichini and Andrew K. Mitnick closed the program with an interactive presentation on the many ways that lawyers can get themselves into ethical trouble and expose themselves to liability, including inadvertent creation of an attorney-client relationship, breaching rules regarding solicitation of prospective clients, providing free legal advice, providing advice beyond one’s expertise, failing to recognize potential conflicts, and failing to maintain client confidentiality.